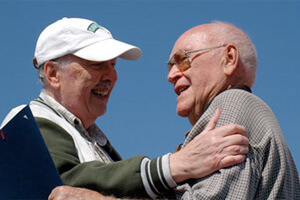 Howard Dahnert (R) with the Cavaliers' Don Warren. Drum Corps International Hall of Fame member Howard Dahnert passed away Sunday, Jan. 23 at the age of 92. Dahnert, inducted into the Hall in 2007, was a longtime supporter of the Racine Scouts. Holding many different positions with the organization, he was involved with the corps for more than seven decades. In addition to his tireless support of the Racine Scouts, Dahnert is often credited as being influential in the founding of the Cavaliers. Cavaliers founder Don Warren wrote in a letter of support for Dahnert's induction into the Hall of Fame: In 1946, I attended a Boy Scout gathering in Grant Park in Chicago. While my troop (#111) put on their dance routine, I walked over to nearby Soldier Field to see what other scouting groups were up to. It was at that time, after walking into the stadium and seeing a group called the Racine Scouts, that I met Howie Dahnert. Coincidentally, as I watched the Racine Scouts, I had an inkling that what I was seeing on the football field would interest the members of my troop much more than what they were doing across the street at Grant Park. I spoke with Howie a few moments that day and he explained the drum corps activity, how his Scout troop was involved, and what it might take to do something like that with my own troop. Dahnert's Hall of Fame induction in 2007.